Rate this Article Gamers are clamoring for a way to be able to play regular PC games in VR. A start-up company in Malaysia is currently developing a smartphone app that will do just that. Playing a game in Virtual Reality is no doubt a thrilling if not exciting experience. However, VR not only needs specialized equipment but specially made content as well. As the market for VR is still going through its growing process and has yet to fill the need for newer content, a lot of gamers are wishing that they could at least play the regular video games that they love in VR. Though VR games may be a little bit different to regular games when it comes to the development process, there now is a way to adapt these regular PC games for use in VR. This, however, is not a simple thing. 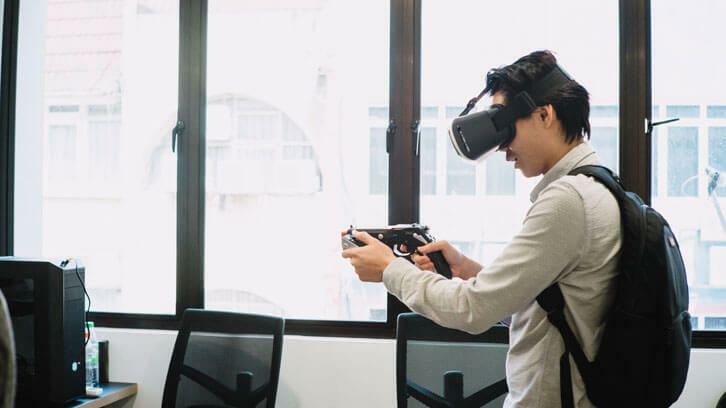 The game mechanics of games meant to be displayed on screen differs from that in VR which relies heavily on headset-tracking and motion capture as a way to interact with the game. Screen-based games, on the other hand, rely on the keyboard and the mouse to travel, look and move within the game. To convert such a game and its gameplay to VR requires a process of converting the pre-existing content into 3D and displaying it in a split screen VR format. Also, the usual keyboard, mouse and controller interface will have to be converted to the motion tracking used by VR. Developments have been made in using the high-end HMD's like the Oculus and Vive to do just this and soon, using one's smartphone to play VR converted games will be available as well. Enter CloVR. Currently being developed by Kuala Lumpur based CloVR studios, CloVR is a 3d injection app that will convert regular game content display into a VR stereoscopic display format and send it via wi-fi to one's smartphone. The phone can be inserted into a mobile HMD like the Google Cardboard, Daydream, Homido and the rest. With this, one will be able to play regular games running on the PC in VR. As for converting the regular game controls to the VR world, the app will make use of the phone’s built-in gyroscope for head tracking. It will also allow users to be able to perform three types of rotations which would be the Pitch, the Yaw, and the Roll. The user will be able to look or move up and down, left or right and forward or backward. Also, since the phone isn't tethered to the PC, the user has the freedom to move around while playing a game. Now, in its final stages of development, the app has been successfully tested with a wide range of PC games. However, best results have been observed when used with First Person Shooters and Role Playing games. The developers have also made it clear that the app can be used not only for games but other VR-adaptable applications as well. CloVR is currently on Kickstarter as the company aims to raise RM14,850 in order to optimize and complete the project. The company plans to provide the app and service as a subscription. The Kickstart starts at RM6 for basic support, RM9 for a three-month subscription and an exclusive RM150 for a lifetime subscription and beta access. The campaigns deadline will be on May 5 while the beta access will be on June followed by the standard subscription by July of this year. The CloVR team is headed by Gan Chee Yong the company's founder and chief technology officer, Lee Yew Chun co-founder and lead developer, Albert Quek co-founder and tech consultant, Jan Wong and Daryll Tan who handle business development and digital ­ marketing strategists Jeremy Ng and Zewin Leung. There are still a few issues when it comes to perfecting the technology like widening the range of adaptable software as well as ensuring the quality of the conversion process as it is well known that regular PC content does not perform as well in VR as VR developed ones. Regardless, the group is currently busy at work to ensure that upon release, CloVR will be fully optimized for its users. For those who are interested in the project, you can learn more by visiting the CloVR's Kickstarter page. The app will be made available for the Android platform but will be ported to the IOS as well.